MRgFUS has shown promise for a variety of conditions, but reimbursement is still an issue. When it comes to MR-guided focused ultrasound (MRgFUS), is there nothing it can't do? That question is spurring preclinical and clinical studies to look at the potential for MRgFUS beyond its FDA-approved areas for treatment of uterine fibroids—even for women wishing to maintain fertility—and pain relief for patients with bone metastases. Clinicians are looking at a full-scale view of the human anatomy as a roadmap to potential next applications of this noninvasive procedure, and ongoing clinical trials are focusing on areas of the brain that control movement disorders from essential tremors to Parkinson's disease. "In general, there is a push toward completely noninvasive treatments and away from surgery, which minimizes risks and substantially decreases patient recovery time," says Suzanne LeBlang, MD, a neuroradiologist and CMO for the Focused Ultrasound Foundation (FUF) in Charlottesville, Virginia. "For example, women with benign tumors such as uterine fibroids often are treated with a variety of surgical procedures, either open or minimally invasive, and these procedures are associated with a multitude of morbidities and even a small mortality rate. Women can die from the treatment of a benign disease." The most well-known mechanism of MRgFUS is the deposition of heat from a high-intensity focused ultrasound (HIFU) beam under MRI guidance to deposit the energy on the desired anatomic target. This noninvasive alternative to surgery kills only targeted cells and comes with fewer side effects than other noninvasive treatments, such as radiation. INSIGHTEC's MRgFUS system, Exablate, was first approved in the United States in 2004 for the treatment of women with uterine fibroids. As word spread of the benefits of this noninvasive procedure, researchers began looking at its use for other conditions. In 2012, the FDA approved Exablate for use in patients with pain from bone metastases. The latest version of the Exablate system received FDA approval in 2015 for symptomatic uterine fibroids, with revised labeling to allow treatment in women who wish to maintain fertility and preserve their uterus. Anne C. Roberts, MD, FACR, chief of vascular and interventional radiology at the University of California, San Diego, ACR vice president, and member of the ACR's Commission on Interventional and Cardiovascular Imaging, says that with uterine fibroids, the goal of MRgFUS is to kill as much of the fibroid as possible. However, lack of insurance coverage and reimbursement remains the main hurdle to widespread adoption. Roberts says the procedure is still deemed "investigational" by payers. There seems to be a fear among insurance companies that allowing coverage would "open the floodgates for an inappropriate use" of MRgFUS. "MR-guided focused ultrasound is a good, noninvasive procedure to treat women with uterine fibroids," Roberts says. "However, not everyone is a good candidate. For example, it's difficult to treat women with multiple fibroids. Practitioners doing this procedure need to be judicious when selecting patients. Using MR-guided focused ultrasound for the appropriate patients will show the best benefits and will increase the likelihood of obtaining insurance coverage." Data gathered from further studies in this area will also help demonstrate value to insurance companies, Roberts says. Mayo Clinic and Duke University recently completed the first study comparing uterine fibroid embolization (UFE) and MRgFUS for the treatment of uterine fibroids. Known as FIRSTT (Fibroid Interventions: Reducing Symptoms Today and Tomorrow), the study involved gathering data from randomly assigned women receiving either treatment, then followed the patients for three years to assess symptom relief, quality of life, and costs associated with each treatment. Data from this study have been submitted for publication. At Stanford University Medical Center, radiologist Pejman Ghanouni, MD, PhD, collaborates with a team of clinicians—gynecologists, oncologists, orthopedic surgeons, neurologists, and neurosurgeons—in spearheading efforts to see where MRgFUS can be applied. For example, for fibroids, Ghanouni codirects the Stanford Fibroid Center, where women are seen by a gynecologist, an interventional radiologist specializing in UFE, and him. He says this collaborative approach results in a specialized plan of care for each patient. "The patient hears from the group and leaves with lots of information," he says. "They're well informed and better able to make an educated decision as to the treatment that's best for them. In other settings, patients don't always learn about all of the options available to them." Ghanouni has seen success using MRgFUS to alleviate pain from bone metastases, as well. He says bone responds well to focused ultrasound due to the fact that it doesn't take much energy to make the target in the bone "hot." "You can use less energy and still be effective," Ghanouni says. "It's safer for the patient." He also says this treatment can help reduce a patient's need for pain medications. "Focused ultrasound for bone treatments is an outpatient procedure. The patient goes home the same day of the procedure and will experience rapid onset of pain relief within a week after treatment," he says. "This impacts the patient's quality of life in a positive way." While using MRgFUS for tumors within the bone, Ghanouni considered another logical application: focused ultrasound for a type of soft tissue tumor called a desmoid, which can be located anywhere in the body. Desmoids can be surgically removed, but for typical cases, that is an unnecessarily aggressive approach. Radiation treatment is another effective option, but there's a question of efficacy in younger patients. There is also a small risk of developing malignancy later as a result of the radiation, which can be a particular concern with young patients. "These tumors will not metastasize, but they are locally aggressive," Ghanouni explains. "They're infiltrative. They can continue to grow in the body and become painful. I thought if we could use focused ultrasound for tumors in the bones, then why not use it for tumors in the soft tissues next to the bones?" Ghanouni is also currently involved in a study using Exablate MRgFUS for soft tissue sarcomas, with the goal of evaluating the safety and preliminary efficacy of this technology in the treatment of soft tissue tumors in extremities. In addition, Ghanouni is working with neurosurgeons and neurologists at Stanford in the area of focused ultrasound treatments in the brain for essential tremor. Stanford is one location participating in a pivotal study to evaluate the effectiveness and safety of Exablate's transcranial MRgFUS thalamotomy treatment in patients with essential tremor. He also sees a future of treatment for other movement disorders, such as Parkinson's disease and epilepsy. "Treatments have been found to be effective and now we are continuing to follow up out to five years to confirm the durability of the treatment," Ghanouni says. "Compared to the alternative, deep-brain stimulation, MRgFUS is a less invasive way to treat patients with essential tremor, with no need to implant an electrode through the skull into the brain." From her perspective at the FUF, LeBlang, who is also medical director of image-guided therapy at the University MRI Diagnostic Imaging Centers in Boca Raton, Florida, successful outcomes with the brain trials could help ease the road to reimbursement. "It's easier to see results with MRgFUS in the brain," LeBlang says. "The neurological benefits are more immediate, and patients improve quickly. This type of data could be enough to help with reimbursement." Reimbursement is a significant hurdle to adoption. Roberts notes that the recent FDA approval of MRgFUS for uterine fibroids in women who would still like to become pregnant could help insurers recognize greater benefits to the noninvasive procedure. However, it all comes down to data, and it's difficult to gather sufficient data without more frequent utilization. "It's the chicken and the egg," says Thomas Andreae, PhD, marketing director of MR therapy with Philips Healthcare. "You can't get reimbursement without utilization, but you can't get utilization without reimbursement." Philips, with its Sonalleve MR-HIFU focused ultrasound system, is currently involved in a number of clinical trials and in preclinical work in the United States; although the company has more than 50 systems installed worldwide—with regulatory approval in Europe to treat uterine fibroids, adenomyosis, and pain from bone metastases—the company does not have FDA approval for use in the United States. In one study, Philips is looking at indications such as bone metastases, pediatric solid tumors, and tumors located in bone or in soft tissue in close proximity to bone. The company is participating in a study currently recruiting participants to determine if MRgFUS is safe and feasible for children with refractory or relapsed solid tumors. The principal investigator on the study is AeRang Kim, MD, PhD, oncologist with Children's National Medical Center in Washington, D.C.
"We've seen lots of good data in these areas so far," says Lizette Warner, PhD, MR therapy clinical science manager for Philips in North America. Philips continues to support their Sonalleve system for treating uterine fibroids, with fibroids being the most mature indication for the technology. However, the company faces challenges with their current trial in this area, specifically in the process for recruiting patients for the study. Andreae explains that Philips was asked to do a comparative study that requires some women with severe symptoms to go through a "mock procedure" lasting two hours, with those results being compared with results from women who had the actual procedure. "A process like that, where some women aren't receiving treatment, just isn't appealing to a person who has severe symptoms," Andreae says. Andreae also says that the required protocols call for quantitative measurements of heavy menstrual blood flow before women can even be considered for inclusion in the study. "The protocols make the study unattractive to patients who might want to participate," Warner says. Organizations such as the FUF, comprising medical specialists, scientists, medical device professionals, and fundraising experts, help to raise awareness of focused ultrasound as an early-stage, noninvasive, therapeutic technology that could transform the treatment of many medical disorders by serving as an alternative to surgery and radiation. LeBlang says the foundation is part of the venture philanthropy and social entrepreneurship movements and has become a model of how donor funding can be used to bridge the gap between laboratory research and widespread patient treatment. "You can accomplish so much when you bring together world leaders to work on the common goals," LeBlang says. "With everyone working together, we have a more clearly defined path that moves from preclinical studies to clinical trials, thus decreasing the time to clinical use." Warner also references the International Society for Therapeutic Ultrasound as a good resource for focused ultrasound information, as well as a home for international collaboration. This nonprofit organization was founded in 2001 to increase and disseminate knowledge of therapeutic ultrasound to the scientific and medical communities, as well as to facilitate the translation of therapeutic ultrasound techniques into the clinical arena for the benefit of patients worldwide. When considering the future for focused ultrasound usage, Warner says Philips is looking in areas such as hyperthermia therapy for cancer treatment. Hyperthermia is a type of therapy in which tumor tissue is exposed to temperatures comparable to a high fever. At these temperatures, tumors become more susceptible to radiation or chemotherapy, making cancer treatment more effective and reducing side effects. Even further down the road, focused ultrasound could play a role in treating cancer and other conditions occurring in abdominal organs, Andreae says. In most cases, it's difficult to provide focused treatment on organs such as the liver or pancreas, as they are moving targets within the body. However, he cites cases in Asia where MRgFUS is being considered for patients with liver cancer. "With pancreatic cancer, you have a diagnostic challenge," Andreae says. "However, there's a benefit to trying focused ultrasound treatment for inoperable patients. Focused ultrasound could offer some benefits—maybe not a cure, but act as a palliative treatment to reduce pain." 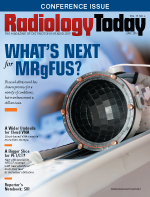 As research continues and more patients seek nonsurgical, nonradiation alternatives to their medical conditions, practitioners of MRgFUS see hope for more widespread adoption and insurance coverage for this radiological solution.